Intergalactic bounty hunter Boba Fett has long been one of fans’ favorite characters in the Star Wars universe, even though he doesn’t get a whole lot of screentime in the original trilogy. The lack of face time, coupled with an awesome suit and backstory, might have actually helped make Fett popular with fans – there are few characters in George Lucas’ universe more intriguing than his sci-fi spin on Clint Eastwood’s famous Man with No Name. We’ve come to learn a bit more about Boba Fett over the years, but a new video that turned up on YouTube late last week is like a holy grail for Fett fans: actual test footage of the character shot between Star Wars and The Empire Strikes Back. In this clip, we see the familiar bounty hunter, but he looks slightly different than he did in the films. Eventually, Boba Fett morphed into the fearsome mercenary we all know and love – and this clip introduces him to us for the first time. There are several really interesting things in the video. 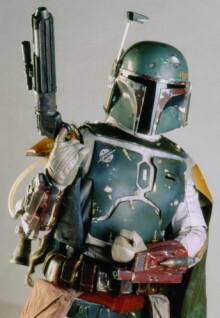 The most obvious is that the early version of Boba Fett was entirely white. We’re not sure that would have worked out in the long run (it would have been great camouflage on Hoth, not so much everywhere else), but it is interesting to see the iconic armor in a different color. We think they made the right call switching to the film version, which is more battered and believable as equipment a guy who’d hunted down some of the galaxy’s most wanted had used in his adventures. What’s more impressive than that is the sheer amount of enthusiasm these guys have for the character. As mentioned earlier, Boba Fett doesn’t have a whole lot of screentime in Empire or Return of the Jedi, but that doesn’t mean these guys skimped on the details or thought of him as a “throwaway” character. You can tell sound designer Ben Burtt is really excited about this new addition to the Star Wars universe, and that the character was conceived with all sorts of gadgets and weapons that we never really got to see in those early films. Check out the clip below and let us know what you think of this piece of early Star Wars history.